You know how brides start to get nervous and crazy as their wedding gets closer from all of the stress? See, I’m pretty relaxed about the wedding, but what I am stressed about is that with the big day just 3 months away, that’s only a few more issues of my favorite bridal magazines showing up in my mailbox! I might not be able to give up my Martha Stewart Weddings after the vows are said and done — especially after this gorgeous race-track inspired wedding in the most recent issue. 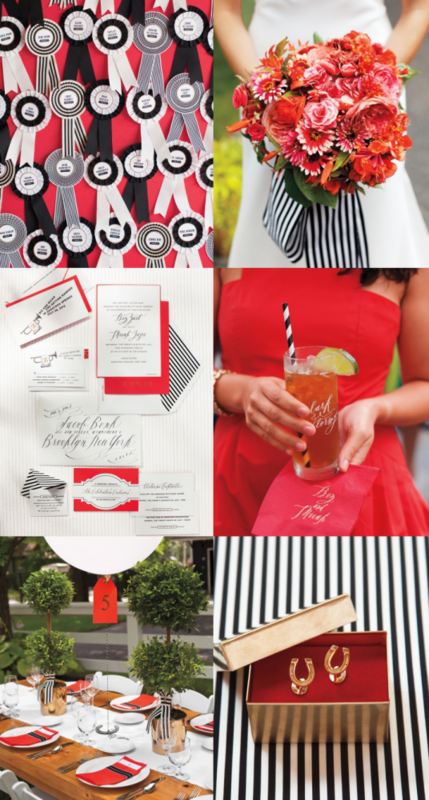 Black and white stripes are playing a big part in our wedding decor, so these ideas are getting bookmarked! See the rest of the wedding here. Harvest Roast Chicken. Envelopes and Ribbons. 6 Responses to "At the racetrack." Black-and-white stripes are playing a huge role in our engagement party (which is this weekend!). Would love to see more of your wedding details! I need those black and white straws for my next party! Love! This could totally be transformed into a fun derby party. I practically grew up at the race track so I especially love this! So exciting your wedding is so close! This is so different and pretty. I love the black and white fabric! That is GORGEOUS. I love how the coral tint to the red makes the black and white not look so dark.